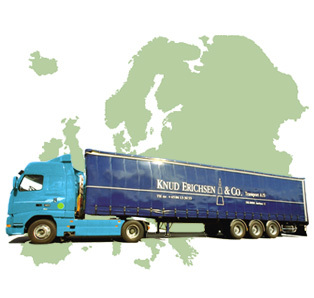 Transport with Knud Erichsen & Co.
Strong agents: EUROLOGISTIC and KBL LOGISTICA; several weekly departures for full and part loads; import and export; committed staff; high level of personal service; 35 years of experience; customised solutions. Direct delivery service to all parts of Central and Southern Sweden; cooperation with leading haulage contractors in Denmark and Sweden; general cargo, full and part loads; import and export assignments; high level of personal service; direct contact to customers and suppliers; over 30 years of experience; great flexibility. Several weekly departures; detailed market knowledge; great flexibility and personal service; agent: Cargo Prague Spol.s r.o. Well-qualified and experienced staff in our customs department; Internet-based customs clearance procedures in the Danish state tax administration SKAT’s newest customs system with express and standard procedures; submission of INTRASTAT data; we are authorised as a temporary bonded warehouse. Direct transport to and from several destinations in Austria; general cargo, full and part loads; several weekly departures to and from Austria; 25 years of experience; high level of personal service; committed staff; great flexibility; customised transport proposals; direct contact.